"Year by year, we are getting rid of more spent nuclear fuel than we produce," he explains, "so our stores are going down." Bulgaria is almost the only eastern European country still sending spent nuclear fuel back to Russia for reprocessing. The Hungarians, Czechs and Slovaks stopped in the 1990s, as the Russians increased the price for accepting it, and as Ukraine increased the transit fees. But just as the other East Europeans were abandoning the Russian dump option, the Bulgarians signed a new deal with Moscow. They had to. The ponds next to the reactors, where the spent fuel canisters were transferred, were nearly full. So was the tall grey warehouse near Reactor Two. Kozloduy managers argued at the time, that unless spent fuel shipments to Russia resumed soon, Kozloduy would have to shut down. It was choking on its own waste. I am taken for a guided tour of Reactor Two. In the control room, technicians study computer screens erected in a line in front of a curving wall of panels. No-one can tell me why everything in nuclear power stations is painted yellow. Then we climb the stairs behind the panels, through a metal door like something from a nuclear submarine, to reach the observation point, a long lead-lined glass window, overlooking two yellow reactors, Kozloduy One and Two. It is rather like being on the bridge of a supertanker, looking down at all the equipment on the deck. But this is a ghost ship. The steady hum is produced by the ventilation system, not the engines. The machinery is draped with thick plastic sheets which lift eerily in the draught, like cobwebs in the breeze. Small green lights indicate that radiation levels are not dangerous. 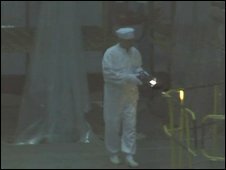 Technicians in white overalls, white hats, and white gloves appear below us, armed with powerful spotlamps, and start to inspect the equipment. Bends in the leaded glass give the men a strange elongated look. It is like a scene from the Russian director, Andrei Tarkovsky's film, Stalker. Next stop, the storage buildings. By now the snow is rising like a great white tide. In the midst of it, workers in yellow helmets struggle to complete what looks like another big warehouse to store the waste - right next to the one which already exists. 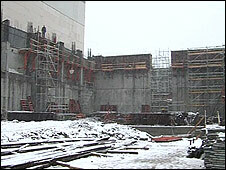 The only difference is that in the old building, it is cooled by water, in the new building, it will be cooled by air. "We are keeping all our options open," says Valentin Ribarski, the man in charge of decommissioning, and eventually dismantling the old reactors, his eyebrows thick with snowflakes. 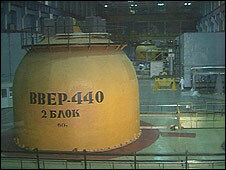 To keep the fuel indefinitely at the nuclear power station, as well as to send it back to Russia. "Is it dangerous?" I shout to him through the blizzard. "Not at all," he shouts back. "We've been dealing with this stuff for 35 years. Moving it from one building to another will be a normal operation." The waste left over when the spent pellets of enriched uranium are extracted from their stainless steel and concrete casing at the Mayak Reprocessing Plant at Chelyabinsk in the Ural mountains. This is the main reason why the other East European countries no longer want to do business with Russia. They do not want to re-import their own dangerous waste. "Aren't you worried by that thought?" I ask Mr Nikolov. "Absolutely not... the Russians have to give us 10 years warning before they do so," he explains. "And that will give us time to prepare." I wheel out my last question. "Isn't it irresponsible to proceed with nuclear energy, if you don't have a safe solution for the waste?" And he wheels out his answer. "Only nuclear power can provide the sheer amount of energy which mankind needs." From Our Own Correspondent was broadcast on Thursday, 26 February, 2009 at 1100 GMT on BBC Radio 4. Please check the programme schedules for World Service transmission times.